My next step is to request temporary digital rights from Leisure Arts for the designs in the discontinued Best of TW Christmas Collection book. Wish me luck! And in case anyone may still be considering acquiring any of the Appleton crewel wool I wrote about awhile ago, most of it is still available! Please contact me directly if interested. 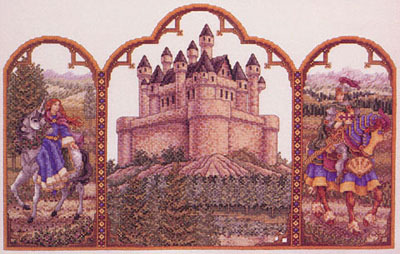 This entry was posted in Needlework and tagged counted cross stitch, Fantasy Triptych, PatternsOnLine.com. Bookmark the permalink. Hello, Teresa. I am looking for your carousel horses chart. I went to patternonline.com and I found spring, summer & fall. But there’s no winter. Will you put it in patternonline.com? Stephany, The Winter carousel horse is part of the Best of Teresa Wentzler Christmas Collection, and I have not yet received permission to release those designs on Patterns Online. I hope to eventually be able to do so. Thanks for stopping by! Someone on Facebook mentioned that your dragon designs are no longer available for purchase from Patterns Online. Sorry to hear that. Would you mind explaining why? Hi Christine. I’m sorry I’d rather not go into an explanation other than to say that the decision to remove them was a deeply personal one involving my faith and my witness to others. Like politics, religion is not something I could ever discuss online. Thanks, and have a wonderful summer! Thank you for replying. Have a great summer. I’m sad you feel that way about your wonderful dragons. IMHO they are the best (not cute, and not too fierce.) I think there were many of us expecting them to be available on Patterns on Line indefinitely and there would there would be some warning before they were removed. I discovered this as I was stitching one from one of the Best of Books and went to purchase the PoL copy as I ran into problems with the chart. I ended up making educated guesses in the end. It is however your decision to make and I wish you well for your future endeavours. We are all devastated at your decision Teresa. Understand it was your decision to make, but there are a lot of people who hadn’t bought those beautiful dragons that will never be able to get them now. I truly appreciate your kind words. Please know that the decision wasn’t an easy one for me; I knew folks might be upset, and I don’t like disappointing people. However, it was time for me to put away subjects I’m no longer comfortable portraying or being known for creating. That said, I heartily encourage you and others who enjoy dragon designs to check out the creations of the many talented fantasy designers out there. There are so many to choose from: they run the gamut from playful and whimsical to dramatic and serious. I do appreciate how much people enjoyed my dragons… but I know there are other designs out there equally (and even more!) worthy of your high regard. I hope you’ll give them a chance! Thank you again for commenting, Jenny! You mention temporary digital rights, how should I see that? Temporary as in bridging the gap until you get the “real” rights back? Or digital rights (POL, I’m guessing) as in available for just five years and then going back to being unavailable? Other options? Good to hear some news, it has been dull in needlework land. Extremely dull. Hey there! 🙂 By temporary digital rights I mean that Leisure Arts has granted permission to allow design releases via POL only, for an indeterminate time. LA also has a digital download service, so it’s conceivable that they may eventually decide the designs will be released via their own platform. I simply don’t know. I am not seeking the return of “print” rights… that ship sailed long ago. Thanks for dropping by and for commenting! Hiya back! Thank you for the reply, now I understand. 🙂 I hope you’ll succeed, I think it’s friendlier to have the patterns still available somewhere, instead of having record asking prices for paper versions of them on E-bay. I still remember the Angel Procession madness. Thanks again for the reply and I hope you have a nice weekend! It’s about time! Love from Letha! Thank you for taking the time to convert these old charts. Is there any chance of converting some of the old, smaller patterns that were published in various magazines? That’s doubtful…at this point, I’m not even sure who owns most of those. Oh well, that’s a shame. Hard to find most of them now. Such beautiful designs! You are my favorite needle art designer! Best wishes!